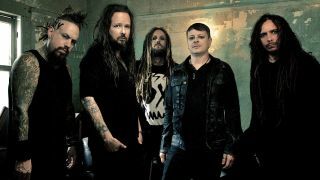 Korn have extended their touring schedule in support of upcoming album The Serenity Of Suffering, adding a run of European shows in March and April with Heaven Shall Burn and Hellyeah. The follow-up to 2013’s The Paradigm Shift arrives on October 21 via Roadrunner Records, after a North American tour and ahead of a UK trip that also stars Limp Bizkit. Jonathan Davis and co last week released A Different World, their collaborative track with Slipknot frontman Corey Taylor, who told KFMA.com: “It was literally a phone call – ‘Hey, you want to do this?’ and I was on a plane the next day. I flew in and I hadn’t even heard the music. “As a fan and as a friend it was something we’d been talking about for years, and all the stars aligned. It’s heavy. It’s so righteous. People are going to lose their minds. The Serenity Of Suffering is available for pre-order now.